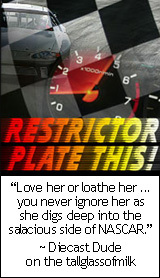 Happy Valentine's Day, NASCAR fans! The last time we ran the Daytona 500 on this holiday of romance was back in 1999. Three-time and reigning Winston Cup Series champion Jeff Gordon went below the yellow like to steal the lead from Rusty Wallace and held off Dale Earnhardt to claim his second 500 win. He was at the top of his game, having won 10 or more races a season for three consecutive years, and was still married to first wife, former Miss Winston Brooke Sealey. We've seen a lot of change in Jeff Gordon's life in 11 years. A divorce, another marriage, a child. Now, he and supermodel wife Ingrid Vandebosch are expecting their second. He no longer has seasons with double digit wins, but he still wins races and he still competes for the championship. What has remained consistent for Gordon is his owner, Rick Hendrick, and primary sponsor, Dupont -- a feat no other driver can claim. Heading into its 18th season, the sponsorship is the longest-running in NASCAR. Gordon will be the only driver to take the green flag in the 2010 Daytona 500 behind the wheel of the same sponsored car as in 1999's Valentine's Day race. To NASCAR fans, the Daytona 500 is a holiday all it's own. Run on Valentine's Day or not, fans are ready to rekindle the flame for another season. Who's your pick to win on this day of love and racing?